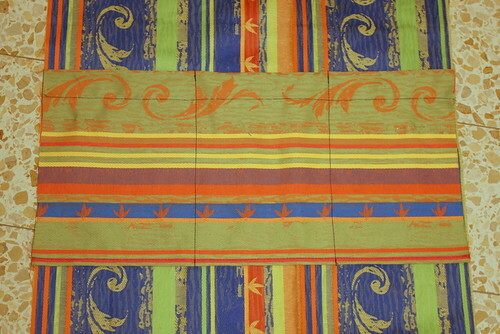 The pattern includes 1/2″ seam allowances. If you only have a yard of fabric, you can eliminate the pocket and shorten the drawstring. Edna gave me two pieces of coordinating fabric (they seem to have been curtain panels), so I used the smaller piece for the pocket. 1. Fold drawstring piece in half, lengthwise, right side out. Press. 2. 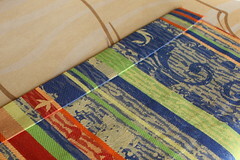 Fold raw edges of drawstring inwards, to center fold line. Press. 3. 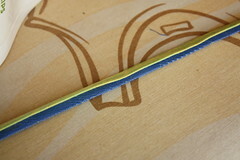 Turn under 1/2 inch of raw edges of strap. Press. 4. 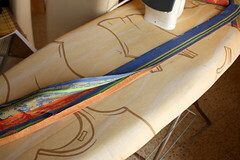 Fold strap in half, lengthwise, right side out. Press. 5. Turn under 1/2 inch of top raw edge of body piece. Press. 6. Turn under 1″ hem of top edge of body piece to form drawstring casing. Press. 7. Turn under 1/2 inch of top raw edge of pocket. Press. 8. 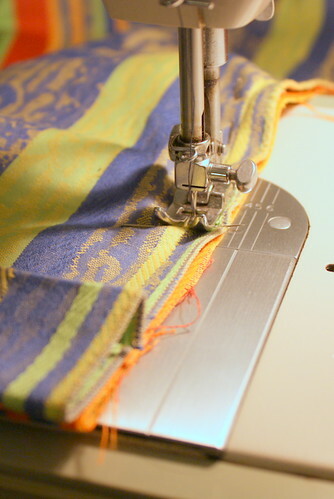 Turn under 1″ hem of top edge of pocket. Press. 9. Turn under 1/2 inch of bottom raw edge of pocket. Press. You’re more than halfway there! With all the pieces pressed, the actual sewing process is lightning fast. 1. Top-stitch drawstring, 1/8″ from edge. 2. 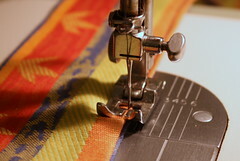 Top-stitch strap, 1/8″ from edge. 3. Top-stitch pocket edge, 1/4″ from folded edge. 4. Pin pocket piece on body, about halfway between the top and bottom. 5. 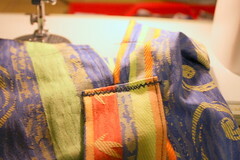 Top-stitch bottom edge of pocket. 6. Stitch two lines to form pocket dividers, back-stitching at top edge for reinforcement. 7. Fold the body piece in half, lengthwise, right sides together. 8. Pin one end of the strap in the seam near the bottom corner. Make sure that the other end is pinned out of the way so that it doesn’t get stitched accidentally in the body piece seam. 9. 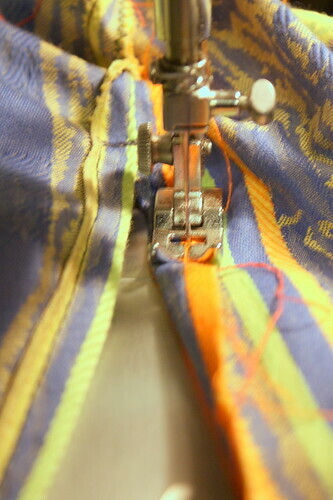 Sew the main seam of the body piece, starting from the narrow end at the bottom, turn corner, stitch up towards the top. Stop 3″ before edge of top hem. This forms the slit opening at the top. 10. 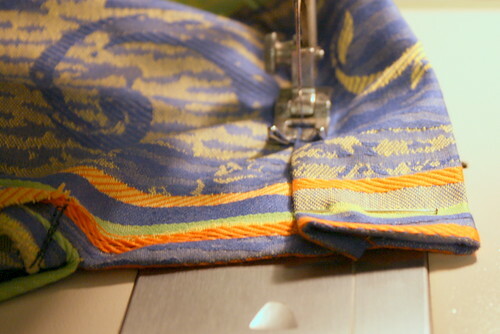 Zigzag over the seam allowance to reinforce and finish the seam. 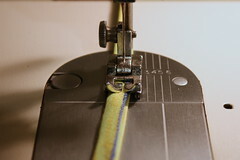 Stop 2″ before end of seam at top so that you can spread the seam allowances of the slit. 11. 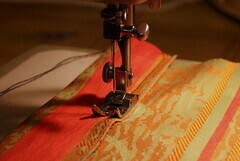 Open the seam allowances and top-stitch the edges of the slit, backstitching at the bottom for reinforcement. 12. 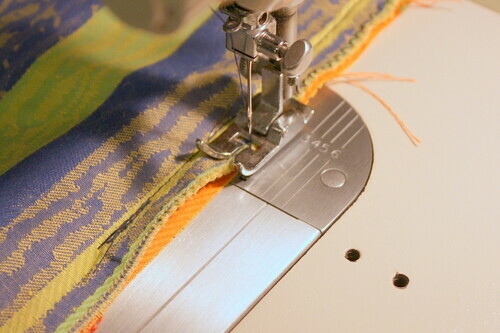 Stitch the hem of the top edge to form the drawstring casing. 13. Turn under the raw edge of the strap and top-stitch the strap end to the body, just below the slit, zigzagging for reinforcement. 14. Thread the drawstring through the casing and tie a knot in each end. 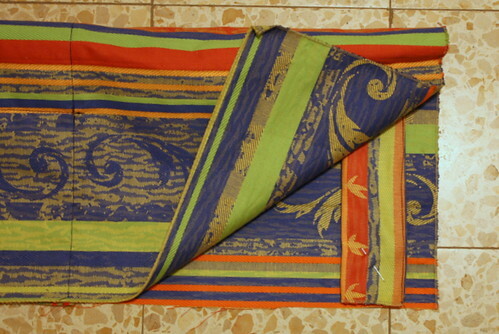 This pattern is for personal use only. All rights reserved. This entry was posted on June 3, 2010 at 7:12 am	and is filed under Crafts, tutorial. 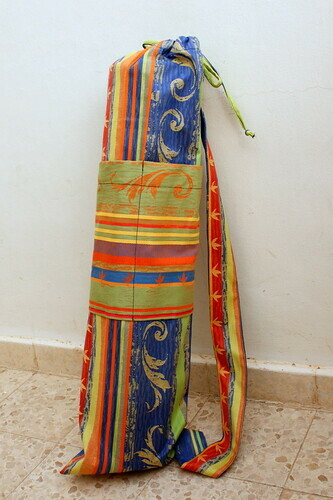 Tagged: pattern, sewing, tutorial, yoga mat bag. You can follow any responses to this entry through the RSS 2.0 feed. You can leave a response, or trackback from your own site. I’m jealous. My mother taught me to knit, crochet, embroider, weave, needlepoint and even a bit of macrame. But this woman, who was a professional seamstress before I arrived, never taught me to sew. Her 1950s Singer sewing machine has an honored spot in my home now that she’s gone, but I wish she had taught me to use it. I love the mat bag. I just tuck my mat under my arm and head off to class. Maybe if I could make something that gorgeous I would attend more often. Why don’t you learn how to use the machine? It’s not rocket science. I learned by doing. I started making my own clothes when I was a kid but my mother really didn’t teach me. I learned from reading books and patterns and Threads magazines. The first thing that caught my eye was the fabric! Beautiful choice. 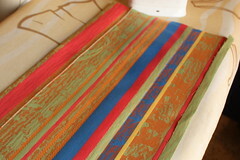 Very good idea to do all the pressing at one time and then sit down and sew. Great system. Must remember! I am sure it can be applied to other projects. And would be a great time saver. About to make one for my niece today! Thanks! Hope that my instructions weren’t causing the problems! Nope, it was me. I thought the pockets were lined up before I flipped it to sew. Also, I opted to add buttonholes for the drawstring (1st time) and boy were they off. Your instructions were wonderful. I plan in trying again this weekend. 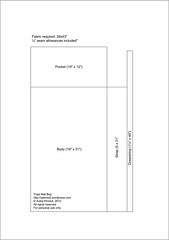 You have the best tutorial I’ve seen for a yoga bag & I’ve been looking for a good one. Zippered welt pocket sounds awesome! Good luck!